The countdown to Christmas begins! One of our favorite holiday traditions is a visit to the Gaylord Opryland hotel to enjoy all the holiday fun and sights. This year’s offerings are even bigger and you can make a day out of your visit. See Santa, ride the Opryland Kids Express Train, build a Gingerbread house and more! The 2018 debut of “A Country Christmas” is November 9th and you can enjoy all the festivities through January 1, 2019. 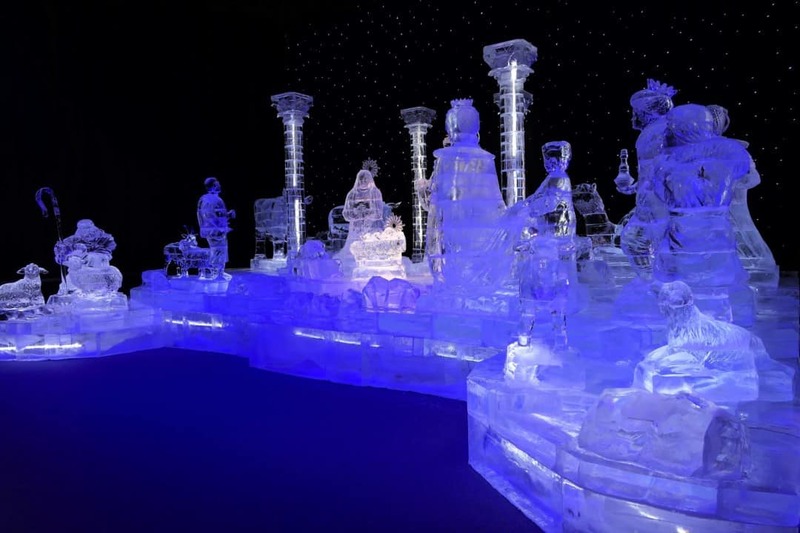 Visit life-sized ice sculptures based on the classic story How the Grinch Stole Christmas. We have discovered going on a weekday is far less crowded. You can also use one of the many Buy 2 Get 2 FREE deals available on certain weekdays to discount your visit. Buy your tickets online or at the box office and start your adventure. The hall is kept at 9 degrees to make sure the ice sculptures stay frozen. You are provided a large hooded coat, but it’s worth wearing several layers underneath to keep you comfortable. Our family wears jackets, hats, and gloves. Our fingers and toes are typically the first to get really cold so it may be worth wearing double socks and 2 layers of hand coverings if possible. You can read more about our ICE! adventures and get more tips HERE. Once you enter ICE! feel free to take your time. The detail on the carvings is amazing! There are also many opportunities for some great family pictures. I think we are going to use one on our Christmas cards this year. Halfway through ICE! 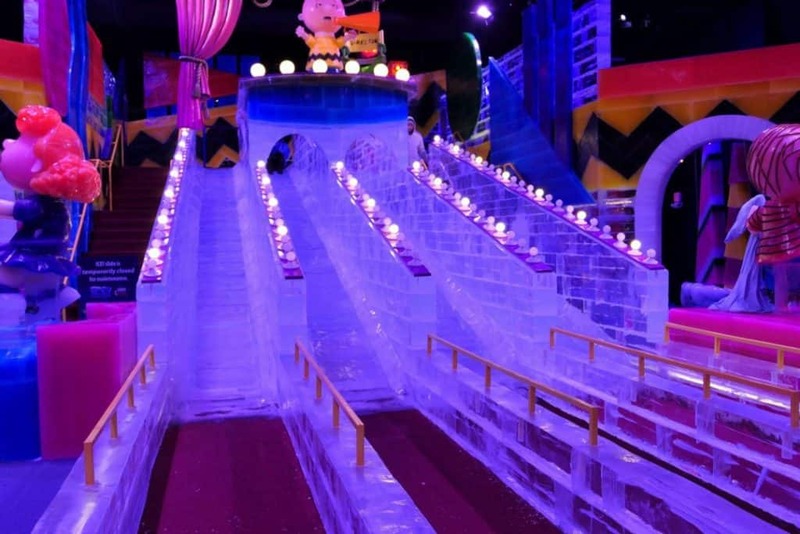 are 4 ice slides that you can enjoy as many times as you care to. Just stand in line to take your turn. There is even a shorter slide for smaller kids. The slide below is from 2017, but there will be something similar with the Grinch for 2018. The final room holds a life-sized nativity and a beautiful angel. Returning for the 2018 holiday season is Cirque Dreams Holidaze, a Broadway musical and cirque adventure for the whole family. The show is 2 hours of fast paced fun including original acts that my family had not seen anywhere. See reindeer jump rope and perform tricks that will make you gasp. Watch a cowboy show his strength in moves that would impress an Olympic gymnast. And that is just the beginning…. The live music, dancing, and acrobatic displays are sure to put your family in the holiday mood! Performances run from November 16 through December 28, 2018. Prices start at $24.99 and children ages 3 and under are free with a paying adult and must sit on a guardian’s lap for the duration of the show. We found some great discounts including a Buy 2 get 2 tickets for free deal. Purchase tickets HERE. Spoil your family with a three course feast prepared by Gaylord Opryland’s award winning Chefs and then enjoy a holiday concert with Trace Adkins featuring songs from The King’s Gift. Tickets are $39.99 for children and $99.99 for adults. We found several discounts for the show including a Buy 2 Get 2 ticket deal. Eat a holiday breakfast with the Grinch! Enjoy a HUGE breakfast buffet with Who-ville themed dishes and table-side visits with the Grinch. Seatings are available daily; make your reservations and purchase tickets HERE. Ride in a tube down a snow packed slide! Fun for kids of all ages (Parents – I’m talking to you!) 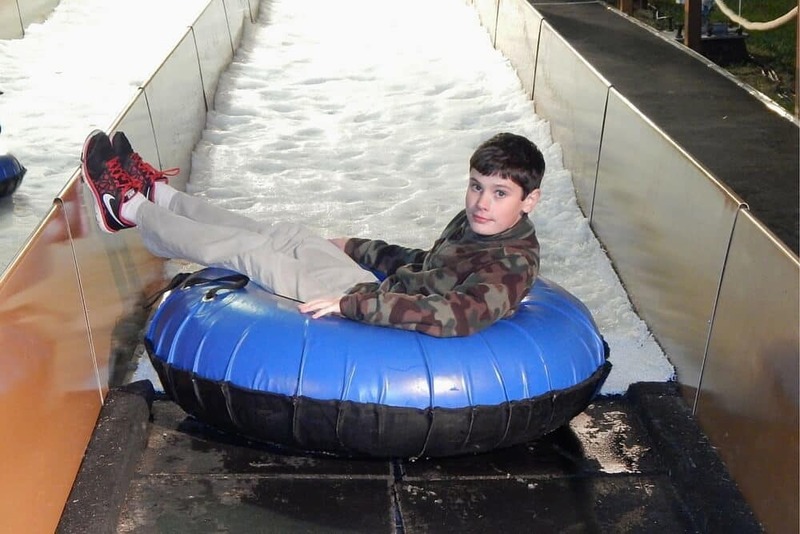 the snow tubing experience provides a tube (in 3 sizes) and a chance to slide 10 times. Have smaller children? Ride down with them in a double tube. There are some height restrictions – must be 36″ to ride in a double tube with an adult, 42″ to ride solo in a small tube, and 60″ to ride a large tube, so be sure to measure before you go to be sure your child is tall enough. Snow tubing opens for the season on November 9 and is available through January 1, 2019. Get all the prices and details HERE. 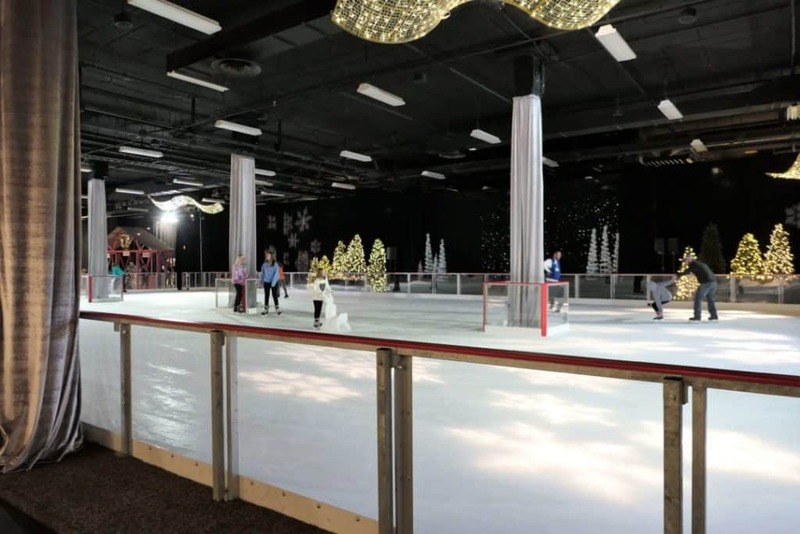 Enjoy an afternoon (or evening) skating in the indoor rink. Admission is $17.99 per skater and it includes rental skates. The rink opens November 18 and will be available daily until January 1, 2018. Purchase tickets and see the rink’s opening times HERE. 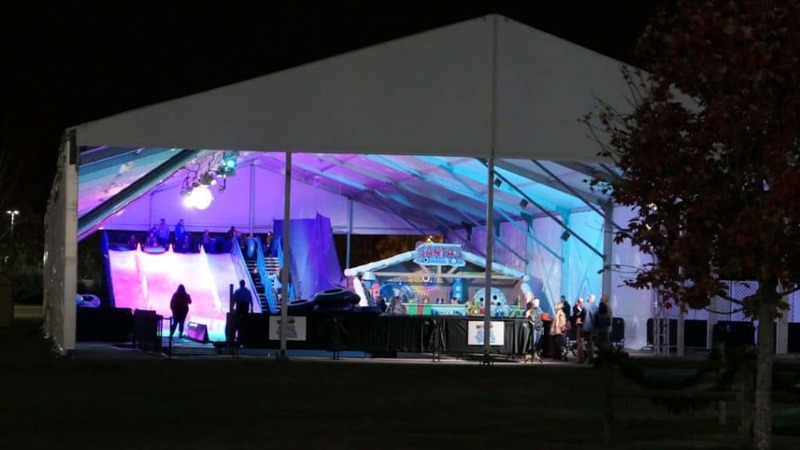 New for 2018 is a 30 minute ice skating show. It is $13.99 per person to attend. Performances start when the festivities open and will be Sundays at 12:30 and 3:30pm, Tuesdays through Thursdays at 5 PM, and Friday and Saturday at 5:30 and 7:30 PM. Take your family on a scavenger hunt through the Gaylord Opryland Hotel and enjoy all the holiday decorations. Last year, we searched for the bears from Build-A-Bear. New for 2018, you can search throughout the hotel’s 9 acres of indoor gardens for the Grinch! Purchase a guide at the Resort Package desk in the Cascades lobby or at the ICE! box office and venture through the hotel in search of the bears. The adventures begin on November 10 and continue through January 1, 2018. There is one huge downside to having so many great Christmas activities in one spot. Traffic. There’s just no way around it friends. Gaylord Opryland is located adjacent to one of the biggest shopping malls in Tennessee. My best advice is this: try to go on a weekday. If you can’t, you can still enjoy a trip to Opryland but you have to be patient. Give yourself lots of extra time especially if you are attending an event at a specific time. 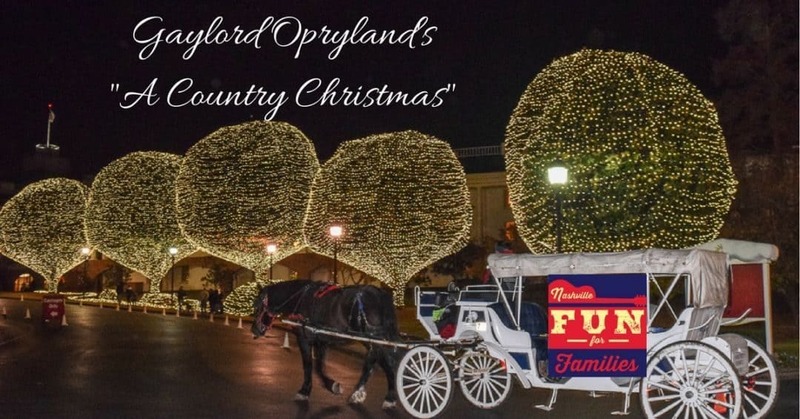 Enjoy the holidays at Gaylord Opryland’s “A Country Christmas”. It’s a Nashville tradition. Listening to Christmas music while driving in the car looking at Christmas light displays in neighborhoods!